In 1973, some of the folks at Hammer Films, a British film factory best known for schlocky horror product, decided to get more ambitious. 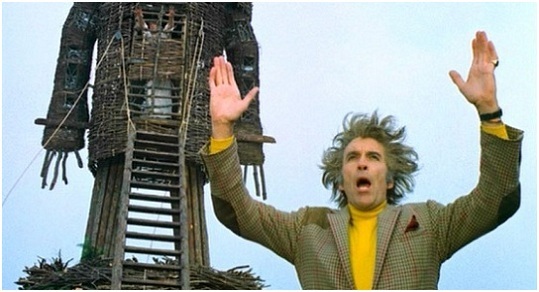 Christopher Lee, of Frankenstein and Dracula renown, wanted to stretch his acting talents, and so he teamed with screenwriter Anthony Shaffer (Frenzy) and director Robin Hardy to create an original, low-budget chiller they dubbed The Wicker Man. The conflict of the plot is twofold. Edward Woodward plays a policeman who is staunchly Christian, virginal, and closed-minded. Sgt. Howie is summoned to an isolated village named Summerisle to investigate the apparent disappearance of a young girl. Once sequestered on this island, Howie is doubly challenged. He receives little cooperation from the odd villagers he interrogates, and his very core goes to war with the way these mysterious people choose to live. The ending of The Wicker Man is justifiably famous, not only for its twist, but also for a truly memorable final shot. I’d place that image on par with the exalted Statue of Liberty visuals in Planet of the Apes.